Millions of Britons will this week embark upon some sort of detox, diet or fitness plan. But according to a new study, the majority will fail, with the average dieter falling off the wagon after just 15 days. 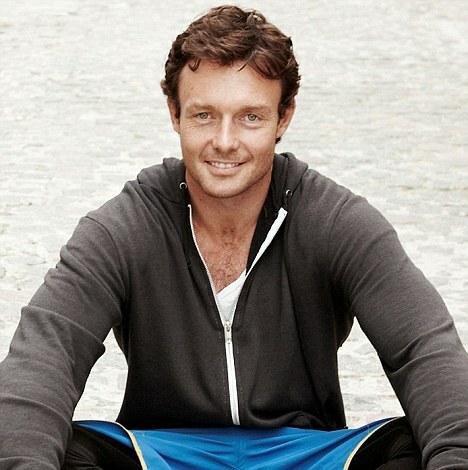 Here, top personal trainer and nutrition expert JAMES DUIGAN says it needn’t be boom or bust. ‘I really would like to help people feel and look better and to succeed in what they are doing,’ he says. Here James brings you some pointers to help you stay on the wagon this new year. January can actually be the toughest and most depressing time of the year to set resolutions. It can really bring up a lot of familiar feelings of failure, shame and guilt. Unless you’ve been really good the whole of Christmas (in which case no one will want to speak to you anyway! ), your body will have a real hangover. After a few weeks of drinking too much alcohol and eating lots of sugar -which are really quite addictive – it takes time to rewire your brain and your blood chemistry to get back to being clean and lean again. Approach cutting back in a gentle way. You need to give yourself a mental break. It’s really important that this doesn’t become a miserable experience. Don’t go cold turkey with your diet. Eat foods that nourish your body and make you feel good, rather than a steamed chicken breast and some dust. Try to give your body a break from alcohol and excess sugar. Eat fruit, nuts, seeds that will still nourish you without making you feel deprived. It’s horrible to waste food, and we’re programmed to feel sinful throwing it away. But all those sweet Christmas leftovers cannot serve any purpose now. Don’t let guilt force you to eat it all; just get rid of it. Bring Christmas cake into work to share with your skinny friends. Give it away if anyone else wants it. If they don’t, throw it in the bin. You make the decision to eat biscuits and chocs when you buy them in the shops, not when you take them from the cupboard. Don’t buy them in the first place, and follow the golden rule: Never go food shopping hungry. Falling off the wagon is feedback, not failure. Think of this as a process – it’s an opportunity to change your life for good, not just for a couple of weeks. If you do overindulge or fail to exercise when you promised you would, don’t be too hard on yourself. It’s part of learning how to get it right. ‘It’s easy to say, "I knew I’d never stick to these resolutions,"’ and to give up. But don’t despair. Pick yourself up and carry on. Think of how a baby approaches learning to walk. They fall over constantly but never give up. Learning to eat and exercise in a different way takes time. You need to keep trying until you get it right. Without wanting to be too dramatic, it really is a matter of life and death. If things are going to pot, sit down for 10 minutes and figure out why you want to get fit or lose weight. Is to be able to play with your children in the park? To stay healthy for your family? Look for the reason you’re sticking to your resolutions. If you want to lose weight to guard against obesity-related illness in later life, perhaps think about the people in your life who love you, and who you love. Whatever drives you to stay healthy will help motivate you. In order to stick to the resolutions, writing down why you’re doing them is a powerful and important part of the process. Make a list of the goals you want to achieve and the reasons why, and stick it somewhere you’ll see it regularly, like on the fridge. It’ll help you stay focused and avoid impulsive moments, like reaching for a doughnut. Evidence shows those who exercis with a friend stick at it much longer than those who go it alone. Find a friend to walk with, run with, or play a sport with like tennis, badminton or squash. Or join a team – you’re less likely to cancel if you know there’s someone else counting on you. Whatever your goal may be, set yourself steps and stages to achieve that will help you on your way. So if you’d love to run a marathon, break it down into stages. Start by walking every day, move up to jogging, then running. Gradually you’ll get closer to your goal. It’s fine to think realistically, but it’s important to do something that inspires you. If your New Year’s resolution is too boring, there’s a danger that it’ll never happen. The hardest thing in the New Year can be taking the initial step to get exercising again. Start slowly and you’ll be back in no time. DAY ONE: Go for a walk and some deep breathing to clear away the cobwebs. DAY TWO: Do some sqauts, lunges and push-ups. (Check out James’s Clean and Lean or Flat Tummy Fast books for exercise plans). DAY THREE: Find an exercise buddy to play a game of tennis, badminton, squash – even to walk dogs together. Anything you can do with a friend. Buddying up will help motivate you through the year. DAY FOUR: Try something you’ve never done before, whether it’s a new exercise class, new activity or a different route. DAY FIVE: Hopefully you’re feeling better and you’re back in the groove by now. Try a 20-minute walk and jog – walk for a minute, jog for 30 seconds. If you can jog for 20 minutes straight, all the better. Finish off with metabolic circuit – squats, lunges, push-ups, dips. Do them all in a row: 20 squats, 15 lunges each leg, 10 push ups, 10 sit ups – with no rest between the sets. Have a minute and a half rest then do the circuit again. You’re exercising your whole body that way. DAY SIX: Do something relaxing – yoga, pilates, or have a massage.